MAY 28, 2017 C-HE WHIZ! Im looking over the hockey rosters for the Nashville Predators and Pittsburgh Penguins, whose Stanley Cup Final series begins tomorrow night in the Burgh. Once again this year Ill be working for the NHL International telecast. In 2016 our coverage was seen in places like Finland and China. Although most of the players are natives of North America (Canada or the USA), nearly 30% come from Europe. I noticed four who were born in a country abbreviated CHE. That cant be the Czech Republic; its tricode is CZE. Nor can it be Chechnya; thats part of Russia. So wheres CHE? I had to look it up. It stands for Switzerland! Of course it does. The story begins 2500 years ago when Alpine valleys were settled by Celts, including a tribe that Julius Caesar knew as the Helvetii. Much more recently, a mere 730 years ago, the area was part of the Austrian Habsburg Empire. In 1291, after the emperor died, three small regions seized the chance to declare their independence and join together. Two of these cantons were called Unterwalden (which means below the forest or subsylvania) and Uri. The third was Schwyz. Their confederation was called Schwyzerland; in modern German, Schweiz. So why isnt the abbreviation SCH? Well, nowadays some of these confederates speak French and Italian and Romansh, so they call their country Suisse and Svizzern and Svizra respectively. And the most common foreign language is English. Presumably these folks would prefer SUI or SVI or SWI, but one cant please everybody, so they came up with a completely different set of letters. I learned that CHE dates to the Revolution of 1798, when Switzerland's outlying regions overcame the dominance of the original cantons and cities. Caesars Latin, the longtime neutral language of official Europe, was used to retitle the country as Confderatio Helvetica. And it is from that name that we get the abbreviation CH, or in this case C HE. MAY 25, 2007 WHY'D HE SAY THAT? With the Pirates leading the Phillies 10-0 in the top of the first, Pittsburgh radio announcer Jim Rooker vows, "If we lose, I'll walk back to Pittsburgh." Three hours and five Steve Jeltz RBIs later, Philly has a 15-11 win. Rooker makes good after the season, walking the 315 miles from Philadelphia to Pittsburgh for charity. Usually, someone confident of winning would back up his conviction by saying something like "If we lose, dinner's on me." Why did Rooker declare "If we lose, I'll walk back to Pittsburgh"? Why would he make that particular promise? What's the connection between the outcome of a game and a pan-Pennsylvania pedestrian peregrination? I can explain the rest of the story. But first, a quick quiz. According to the Rand McNally road atlas, which of these six cities is the shortest walk from Pittsburgh, PA? Which is farthest away? Click here for the answer. The Pirates had not won since a home game on Tuesday, May 30, 1989. Their current road trip had started at Shea Stadium, where the Mets swept a three-game weekend series. Then they played a 7½-inning tie in Philadelphia on Monday before losing to the Phillies on Tuesday and Wednesday. There was one more game to be played in Philadelphia, but KDKA-TV wasn't televising it, so I flew home on Thursday morning, June 8. Going into the series finale that night, the Pirates had a miserable 0-5-1 record on the trip, not to mention a seven-game winless streak. Following the game, the team was scheduled to return to Pittsburgh, where they would open a series against the Mets on Friday. Only once all week had the Pirates scored as many as three runs in an inning, but on this Thursday against Larry McWilliams, in the top of the first they put ten on the board! Highlighted by a three-run Barry Bonds home run, it was their biggest inning of the season. In the bottom of the first, Bob Walk took the mound for the Pirates and allowed the Phillies to chip away at the lead with two runs of their own. 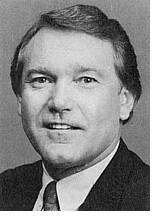 Up in the Veterans Stadium broadcast booth, Jim Rooker must have thought something like this: "We've been losing every night, but this feels a lot better. We've turned things around. Surely we can't lose this game. Not with a ten-run lead. Can we? Oh, gee; I don't want to be a pessimist, but if we blow this lead, Jim Leyland is going to blow his top. The whole team's going to be in a rotten mood. I wouldn't want to be on the airplane with those guys. No, if we lose again tonight, I'd rather say 'see you later' and find my own way home. Heck, I'd rather walk!" And so that's what he said on the air. "If we lose this game, I'm walking home to Pittsburgh." The Pirates were not going to be involved in the postseason, so "Rook's Unintentional Walk" was scheduled for October 5 through 17, 1989. With the assistance of a support crew underwritten by four corporate sponsors, Rooker walked about eight hours a day at three miles per hour, raising $40,000 for Children's Hospital and the Bob Prince Charities. Cincinnati businessman Powel Crosley, Jr., manufactured many products including low-priced radios. 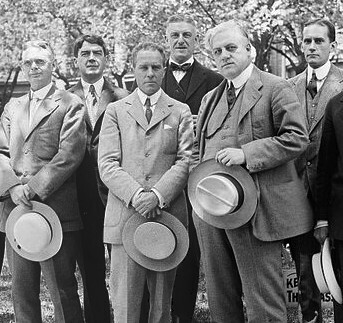 To sell the radios, he established station WLW in 1922. 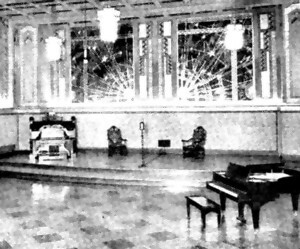 Home-brewed programs from this studio included a late-night show of romantic poetry and organ music. One of the few programs designed to put people to sleep, it was broadcast for 42 years beginning in 1930 under the name Moon River (predating the Henry Mancini song). In 1948 WLW branched out into television. Like the radio station, WLW-T produced a number of local live programs. One of them was The 50-50 Club. 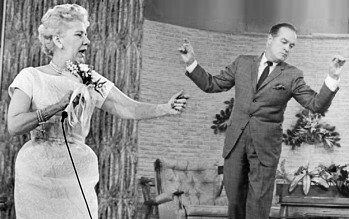 This was a midday talk and variety show hosted by Ruth Lyons, who decorated her microphone with a hand bouquet. The title refers to the size of the studio audience, originally limited to 50 ladies and later doubled in number. Many of these programs were seen simultaneously in other cities on stations owned by the same company. For example, David Letterman remembers his mother watching Ruth Lyons on WLW-I in Indianapolis. Our family occasionally saw The 50-50 Club on WLW-C in Columbus. And on that station on Saturday evenings, we watched Midwestern Hayride. 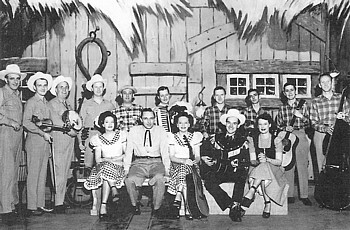 This show featured country music and also (in a nod to Cincinnatis German neighborhoods) Polka Time. My father enjoyed the country tunes, my mother enjoyed the polkas, and I shrugged at the square dancing. Once in elementary school I needed a name for a fictional character, and I came up with Zeke Turner. Where did you get that name? asked my teacher. At first I didnt remember where it came from. Then I realized, somewhat to my embarrassment, that Zeke Turner was a Midwestern Hayride performer. Thats Zeke on the right. In 1957, WLW-T took delivery of three massive RCA TK-41 color cameras. 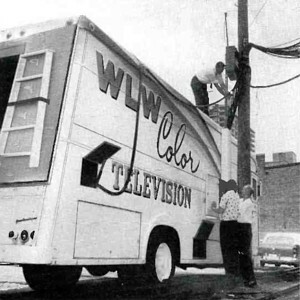 They hooked them up to this mobile control truck parked outside their Crosley Square studios, and starting on Friday, August 9, the Ruth Lyons show was in color! The following evening, Midwestern Hayride also began using the new color cameras. We viewers were impressed, even though our family, like most, was still watching on a black-and-white TV set. An RCA publication describes WLW-Ts color coverage of baseball. To air a dozen Cincinnati Reds games each year, they would take their three cameras apart, carry them downstairs to the truck, and drive a mile and a half to Crosley Field. There they positioned the cameras overlooking home plate and first and third bases. The middle camera could swing around for shots of the announcers and their live commercials. 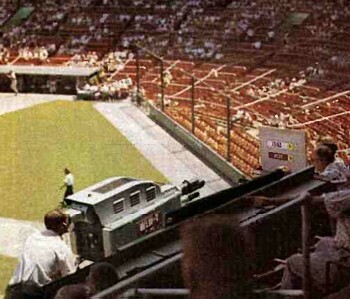 The third-base camera also could swing around for graphic cards, such as the game score that's being shot here during pregame rehearsals. As nearly as I can reconstruct it from the photo, the graphic was rather basic. But this was still the Fifties, after all. Six years ago, when I wrote about my brief career as a Bingo caller on a local cable channel, I saw it coming. "Nowadays the big networks are cutting back their expenditures. Labor troubles with both writers and actors are threatening scripted shows, and we're seeing more 'reality' TV, which is cheaper to produce. What could be cheaper than Bingo? Is Regis Philbin available to call the numbers? If not, perhaps Tom Baby could be persuaded to make another comeback." Sure enough, last night National Bingo Night made its debut on ABC-TV. Compared to the show we used to do on cable, this is a much glitzier version, with a lot of the glitz added during post-production. However, one fact hasn't changed: simply calling the Bingo numbers makes for boring television. You've got to do something entertaining at the same time. NBN solves that problem by simultaneously playing a gimmick game, in which a single contestant triggers the calling of the numbers and tries to use them to reach some sort of goal before any of the 200 Bingo players in the studio audience gets five in a row. The first game last night was an emotional rollercoaster. We rooted for the contestant, Joe, as he got closer to his goal. On O-67 he reached it, winning $50,000 for himself and his family, who were cheering him on from the back of the studio. But wait! Eighteen of the studio players had been one number away from Bingo before O-67 was drawn. Had O-67 given any of them five in a row? After a long, tense interval to set up the drama, one studio player did jump up and shout out "Bingo!" He was happy and jumping around. Joe was devastated. Moments before, he had been happy and jumping around, thinking he'd won big, but now he would go home with nothing. This rang false with me. The studio player had four in a row and was saying to himself, "Come on, O-67!" That very number was drawn, and he had a winning card. But the show's producers had told him not to call out that fact immediately, as he would in a normal Bingo game. No, he had to wait  more than a minute and a half, in the version that aired. And when he was allowed to proclaim his win, it seemed as though he was celebrating a theft. He'd stolen the money away from Joe, the nice guy we'd been pulling for. But of course, the show was arranged so that in the third of the hour's three games, the gimmick contestant did win, and she brought her celebrating family onstage as the credits rolled. Everybody was happy. MAY 17, 2017 WHERE? WHEN? 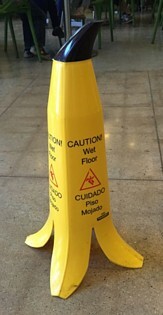 I've begun to encounter plastic banana peels like this, warning of slippery just-mopped floors. They remind me of a similar object I deployed nearly 40 years ago. 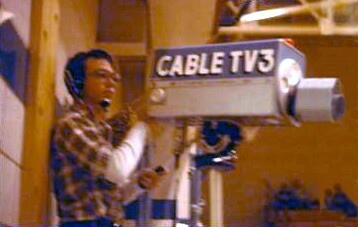 In the 1970s, I was the program director at Cable TV-3 in Washington, Pennsylvania. We frequently took one of our cameras out into the community to cover a high school swim meet, a church service, or some other activity. We rarely televised anything live; instead, we taped the event to be shown later. We endeavored to answer that question, even before it was asked, by painting our name as boldly as possible on the side of the camera. Usually the first airing would be later that same night, after wed returned the tapes to the studio. The second airing would be a couple of days later and at an earlier time, for the benefit of viewers on a different schedule. Would they remember? We needed all the viewers we could get. Budget concerns eventually ended our local origination efforts. However, in the months before that happened, I built a three-sided pylon that could be placed near our camera during tapings. On the right is an approximation of how my homemade invention looked. It was about three feet high and made of poster board in an attention-getting yellow color. I folded poster strips into sleeves that could be slid down over the top of the obelisk. A stack of four appropriately chosen sleeves, each with a time or day in Magic Marker on all three sides, would remind onlookers when they could tune in. A century ago, some people considered my great-great-grandfather George Scholl to be an enemy alien, although he was 89 years old and had been an American for seven decades. Although there was no reason to suspect Great-Great-Grandfather George of treachery, he did possess a suspicious book. Therefore, officials such as these from the Alien Property Custodians office confiscated the old mans Bible. They couldnt decipher the foreign language, but there were many many words and some of them might have been instructions for enemy saboteurs. I added some background about this incident (in a box labeled 2014 Update) to my article about a trip to Georges adopted home town. Its this months 100 Moons article. More than two dozen sound clips are included from a Mothers Day visit with my fathers mother and other relatives in Livermore, Kentucky, 45 years ago. Incidentally, one of those relatives was my fathers brother Philip. Near the end of the Mothers Day article, he arrives with his family. Uncle Phil was 15 years younger than my father, and he was only 19 years old when he fought with the Marines on Tarawa Atoll in the Pacific. He lost an eye in that 1943 battle and was awarded the Purple Heart. Like my father, Phil studied accounting at the Bowling Green Business College. He also attended the University of Kentucky, where he kept the scorebook for legendary basketball coach Adolph Rupp. 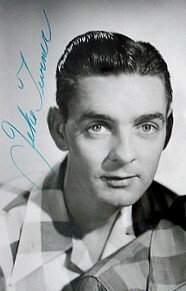 My first memory of him was from the late 1950s. 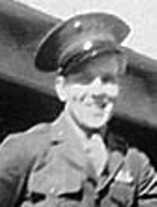 He was involved with the construction of locks on the St. Lawrence Seaway, and he was living in Massena, New York, with his Texas bride Sue. 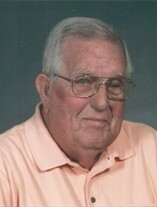 Later Phil worked for several coal companies in Kentucky, owned an insurance agency in Greenville, and helped found a bank in Madisonville. In 2013, Phil fell and broke his hip. Unable to walk or even to get himself from his bed to his wheelchair, he needed more care than his wife and two others could provide. After a couple of months, he had to check into the Western Kentucky Veterans Center, six miles from home. He was still there when he died this spring at the age of 92. A 2004 law requires Pennsylvanias 12 casinos to pay their host municipalities an annual fee. The amount is either two percent of their slot-machine revenues or $10 million, whichever is greater. As a result, smaller casinos have to pay the full $10 million. For them, that may be five or ten percent  an unfair competitive disadvantage. They would prefer the assessment to be a consistent two percent for every gambling mecca, regardless of size. On the other hand, many taxpayers want to keep the law the way it is. If it were changed, cities with small casinos would be denied their guaranteed $10 million windfall, and the cities taxpayers might have to make up the budget deficit. Nevertheless, the state Supreme Court recently agreed with the small casinos and struck down the either/or part of the provision, ruling that its inequality violates the state constitutions uniformity clause. But this is ridiculous. How can listeners know enough to agree or disagree with the Supreme Courts ruling? Do they have sufficient law-school training? Are all of them legal experts on the wording of the Pennsylvania constitution? No, the majority doesnt disagree with the decision on constitutional grounds. Rather, the majority dislikes the decision because it could raise their taxes. In the early days of slow-motion sports replays, a spinning disk held 30 seconds of action. If you wanted to save the replay for later use, you needed to re-record it onto video tape, because the disk would soon be erased to record new action. 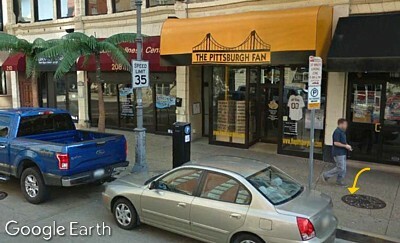 A couple of weeks ago, I was strolling down the sidewalk on Federal Street on Pittsburghs North Side. I made the mistake of looking where I was going: ten yards ahead, to check out two palm trees. They couldnt be real, could they? In Pittsburgh? I should have been looking down. I should have been making sure I was placing each foot on a level spot. Suddenly I was flat on my face, my hat and sunglasses rolling away, a slight cut on my lip and a bruise on my knee. The folks from the nearby Mullens Bar & Grill arrived to offer assistance immediately, helping me back to my feet and treating my cut. What happened? I assume I must have tripped, probably over a manhole cover (arrow). But I have no memory of tripping and no memory of falling. One would think I would have such memories, almost in slow motion. Whoops, I stubbed my toe, and my foot has been prevented from striding forward. I need to lift it up and throw my leg forward to catch myself before I lose my balance. But Im old, and I cant swing my leg that fast. Uh-oh, Im tilting forward. I dont want to fall. I hope it doesnt hurt. Here comes the pavement! All of that might have been recorded in my short-term memory, which holds a few seconds. But then my head bounced off the sidewalk, and the short-term memory was erased without being transferred to long-term memory. It is no longer available for replay. At least thats my theory. 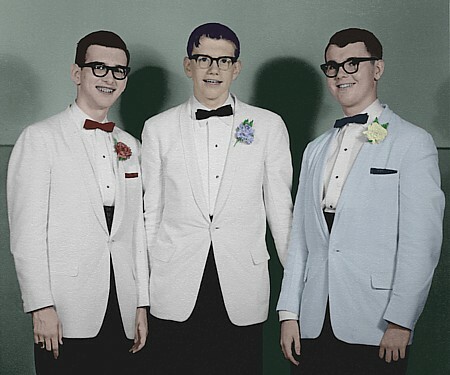 That's me with Carl Martin and Terry Rockhold (L to R) in a colorized photo from the Richwood High School Junior-Senior Prom. Was it 1964 or 1965? One clue is that I'm wearing my "black diamond" class ring. Did we receive these before we were seniors? MAY 3, 2007 DEMOCRACY A PANACEA? We invaded Iraq to remove the Saddam Hussein regime and replace it with democracy, predicting that popular rule would be so successful there that the entire region would adopt it. Obviously any repressed people, given the chance, would vote the way Americans vote, and soon all Arabs would forget tribal differences and become secular capitalists like us (or maybe even become Christians). This experiment, unfortunately, has had a less than auspicious first four years. Many Muslim clerics oppose democracy on principle. People should not follow their own desires but rather the teachings of the Koran: for example, a man should marry a woman. Give the people democracy, and their representatives are free to pass any legislation they like: for example, two women could marry. And the Muslim people, taught to honor their religion above any personal opinions they may have, tend to agree it's dangerous to give legislatures the opportunity to overrule scripture. For a different reason, prosperous Chinese may also distrust majority rule, despite our dream  The China Fantasy, according to author James Mann  that economic freedom will turn them into democratic consumers just like us. Reviewing Mann's book last week, George F. Will noted, His most disturbing thesis is that the newly enriched, Starbucks-sipping, apartment-buying, car-driving denizens of the large cities that American visitors to China see will be not the vanguard of democracy but the opposition to it. There may be 300 million such denizens, but there are 1 billion mostly rural and very poor Chinese. The question is whether the rich minority, prospering under the Communist regime, will ever find it in their interest to give democracy to the billion.